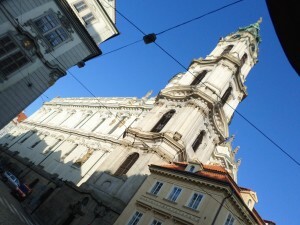 I have been living in Prague, Czech Republic for one week now so I hope I have at least some sense now of how it is and how it will be while I’m here. The week started rocky, with my Sunday evening flight out of Toronto delayed just after boarding at 1800 due to ice on the parking area. The plane was unable to taxi out to the runway because it couldn’t get any grip on the ice. We waited 2 hours for them to spread sand around enough to push the plane out with a taxying truck. It went relatively fast because the in-flight entertainment system was active and I watched the entire movie: The Signal, which was a really good movie. 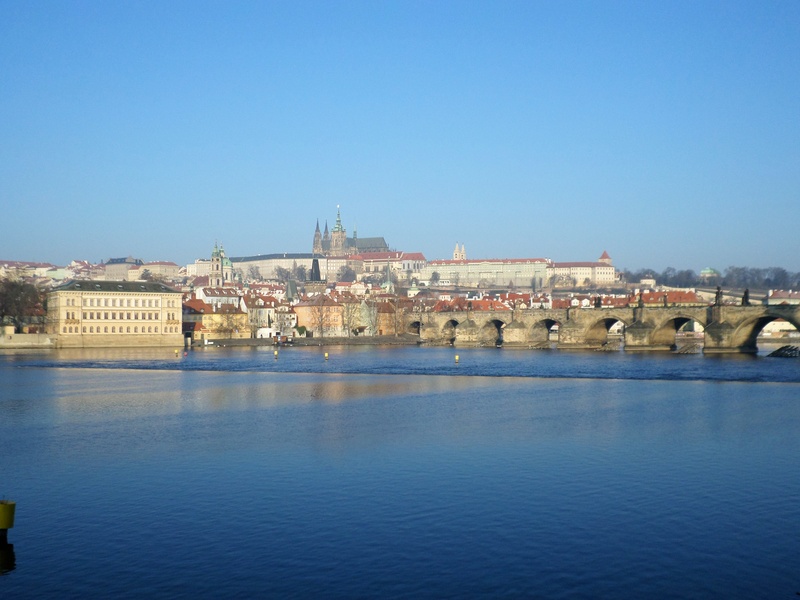 By the time the plane was somewhere over the Atlantic I realized I wasn’t going to make my connecting flight in Frankfurt, and decided to splurge on some in-flight internet to send an email to my client, Vlad, who was picking me up from the airport in Prague. My new departure from Frankfurt was then 1300 on what was then Monday, and I was out of the Prague airport just after 1400. Being still so early in the day I decided to just stay up until a normal hour so help combat jet lag. Vlad bought me my first Czech beer (which didn’t help with the trying to stay awake) and we stopped by the office to pick up some paperwork and let me use the internet. When I got back to my flat despite checking each of my electronic plugs to ensure they worked in 240V plugs I forgot to check the power bar I brought and it tripped the breaker for the entire flat. That took a while for me to figure out where the main breaker panel is (it was in the hallway outside my flat). 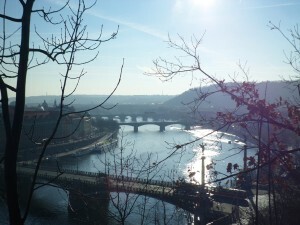 On Tuesday Vlad helped me to get set up in Prague. I got a 90 day metro pass, opened a local bank account, got a local SIM card, and in the evening I got high-speed internet hooked up in my flat. Then I took a walk to the local Tesco to find some of the things that were missing from my furnished flat like plates, cutlery, cups, paper towels, and other random things you never think about that are just lying around after you have lived on your own for a while. The rest of the week was pretty cut and dried after that, during the days I’d work on code and at night I’d walk over the Tesco to buy a few more things for the flat and some cheap prepared food. Saturday was the day that I really got to see what this city has to offer. 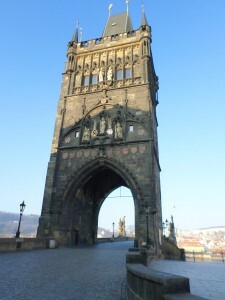 I started out at 0800 on the metro downtown, walked up to Karlův most (Charles Bridge) before it got too late in the day. I had been warned by several people that it gets pretty crowded, even in the off season on a Saturday. I got some pictures I’m pretty proud of and moved into Malá Strana (Lesser Town) where I wandered all over the place and found some really nice unbeaten paths. 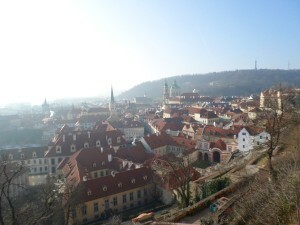 From there I headed north in a round-about fashion to the old castle steps; a series of, what feels like one thousand, steps up to the top of the hill where you will find St. Wenceslas’ Vineyard. I would recommend for many reasons to start your trip to Prague Castle from the top, take the tram to the north-west side, see the castle from “the front” and work your way down the hill, at the end you can travel down all those steps to Malá Strana over Karlův most and into Staré Město (Old Town). At the top of the hill I found the Lobkowicz Palace which offers a tour which includes an audio guide in your desired language. This was good if you like history, and lots of paintings of old family members. Most of the audio guide is entries about specific family members and who they married and how the family name continued. Eventually you will come across the weapons rooms which I found particularly interesting because they have so many and they are laid out in such a wonderful way. Afterward you walk into the music room, which has some interesting history about Mozart and Beethoven. There are plenty of other rooms after those, including one dedicated to the family dogs. When you are done you can pass through the gift shop into the cafe. It was a chilly day, but with the area heaters and blankets I decided to sit out on the terrace and have a cappuccino and apple strudel in peaceful quiet. They were both fantastic and worth going into the cafe next time I’m up that way. Since this was my first time to Pražský hrad (Prague Castle) I decided to pay for a pass to get into the exclusive areas. 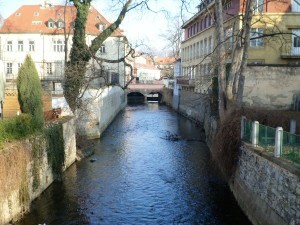 This started with the Golden Lane, which is a row of houses built into the base of the defensive wall. Most of the little houses have been converted into closed off dioramas showing what it would have been like hundreds of years ago. A few have been converted to shops that mostly cater to tourists with souvenirs. There is a large collection of armour, shields, and weapons on the upper ramparts of the wall, including many swords and daggers with flintlock pistol mechanisms attached. I thought that was something that only showed up in video games like Assassin’s Creed or Dishonored but apparently some industrious smithy put the idea together centuries ago. At the end of the Golden Lane is the house Franz Kafka lived in while in Prague, which is nearly overflowing with movie reel tins. Next on my tour was Bazilika sv. Jiří (St. George Basilica) which seems rather plane from the outside and in the main hall, and it doesn’t help to be right next to St. Vitus Cathedral, but it does have a room full of frescos that you cannot get very close to, and on the way out you pass by this really unusual altar that is in a room with paintings on the domed ceiling and bones in the altar, it’s all much more elaborate than the rest of the basilica. I then went into the Starý královský palác (Old Royal Palace) which opens into a giant great hall and walks through a bunch of different rooms with information about the royal family, including a room full of family crests up and down the walls and ceiling. 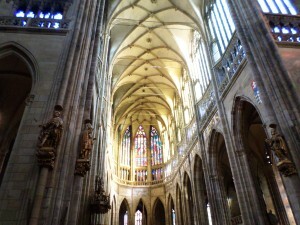 The last part of the Prague Castle tour for me was the Katedrála sv. 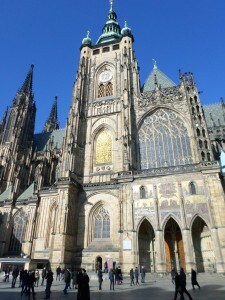 Vita (St. Vitus Cathedral), which is the spires you can see in just about every picture of Prague Castle. This cathedral is immense and opulent, with carvings, gilding, frescos, paintings, and so much lavish appointments. You can get in the front door of the cathedral without paying, but to see all the decorations near the back you have to pay. I thought it was worth it to see at least one time. 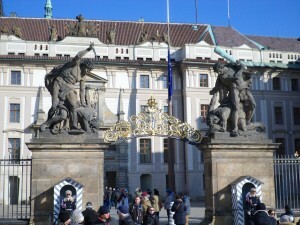 Afterwards I checked out the main gate of Prague Castle, just in time to see the changing of the guards ceremony. Going west from Prague Castle I went looking for the Muzeum Miniatur (Museum of Miniatures), which I found up some steps near the Strahov Monastery. The museum is not very big, you can do a Google streetview on the entire room on their website, but it’s filled with about 30 microscopes to look at the amazing sculptures stuck inside grains of rice, on the heads of needles or legs of fleas. You can see the object and then look at the microscope, it’s really quite amazing. One of the best pieces in the museum and easily worth the cost of admission is the Eiffel Tower in a grain of rice, it is so detailed. Afterward I wandered the area, including Strahov Monastery for a while and then took a tram up to Letná Park, which isn’t very populated in cold weather, but it was still quite nice to walk around. I can imagine it’s amazing in the spring and summer. Near the southern edge you can get fantastic views of the city. Then I walked down a few dozen steps to Czech Bridge and into Staré Město (Old Town) where I happened across the monument to Franz Kafka and found my way to Wenceslas Square which was something to see because right now is Carnival, so a very large celebration with lots of people. Unfortunately my camera died just as I got there, but I plan to go again this weekend to see what I missed. This is one of my longer posts, but I really wanted to get all this information down without leaving out too much. I will be posting more often so that individual posts will be a little less verbose. This is so far quite an adventure and I look forward to what happens in the months ahead.